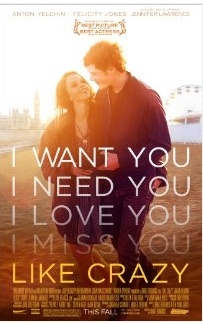 the happygirl: entertainme: review "like crazy"
Love. Oh, that crazy head over heels first love where just watching your love sip their coffee makes you lightheaded with giddiness. If you've ever felt that first love and you wish you could experience it again, then go see "Like Crazy" the film that won both the Grand Jury and Special Jury prizes at the 2011 Sundance Film Festival. Starring the lovely Felicity Jones (Anna) and Anton Yelchin (Jacob), the film feels more like a voyeuristic peek inside college students love lives rather than a fictional movie. It could have been a simple boy meets girl, girl leaves, boy pines for her kind of movie but instead it's a warm, sweet, painful look inside a couple who meet, fall in love, throw caution to the wind and then pay for that mistake with a separation so wistful you will grab the hand of your love in the theatre and whisper "I love you. I need you. I love you." Director Drake Doremus took a unique approach with his actors by combining a short shooting schedule along with allowing them to improvise the dialogue. I spoke with Felicity recently and we spoke about the trust that developed between she, Anton and Drake. Watching this film you can see the freedom the actors felt in the intimate scenes. There is one scene especially that is poignant. Have you ever just spent a lost weekend with the love of your life? Now imagine a lost Summer spent in bed holding onto every single special moment knowing that when Fall comes their bubble will pop and they will be separated. It's a great montage scene of Anna and Jake over the summer in bed, in love. It's one of the loveliest scenes, reminiscent of "The Notebook." "Like Crazy" is a quiet movie. It's a whisper in the ear, a subtle, beautiful, hazy, sweet film that will send you right back to your first love when life was just about the two of you, before life got complicated.